Paul Mann’s latest proves that determination, custom design and attention to detail blends a tournament fishing yacht with luxurious style and does so magnificently. Walk into any marina and you’ll see a lot of white boats. There may be yachts, but if she’s there, you won’t miss the new Paul Mann 61-foot Jichi, a sportfisherman that draws attention with a striking color scheme of platinum and black accented with warm, polished teak. She’s docked stern-to at the Cocoplum Yacht Club in Coral Gables, Florida. The rich, deep teak of the cockpit and mezzanine outlined by the faux teak toe rail and transom pulls eyes in before the gleaming upper deck and polished tower structure draw your attention upward. It’s easy to see this is one special boat. First thoughts are of fishing. It’s impossible to miss the 47-foot outriggers, the abundance of rod holders and the Release Marine Rocket Launcher fighting chair in the cockpit. 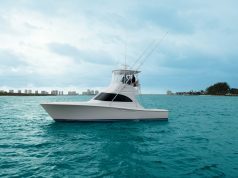 Clearly, the owner is an experienced tournament fisherman who enjoys the fight of billfish, but the meticulous styling says his good taste goes beyond sporting activities. The result is a smart, clean, contemporary, three-stateroom, three-head layout with megayacht appointments: cedar-lined hanging lockers, custom-built showers and sinks, Eurostyle flat panel doors and drawer fronts with push locks and concealed catches, carpeted cabins and bunk storage areas, custom headboards and upholstery, marble countertops below with Ice Crystal Quartzite countertops in the galley, custom dinettes, and electric window screen shades. A complete entertainment system with TVs in the salon and in each cabin include Fusion, Bose, JL, Apple, and Samsung equipment throughout. With the addition of the Miele induction cooktop and microwave in the galley, the interior of this sportfish is more yacht than fishing boat. Speaking of fishing, during a tournament, it’s key to get out to the grounds fast, more like, first. Twin Caterpillar Acert C32s provide 1,925 horsepower each that comfortably get on it at 40 knots even when seas are rough. The 1,750-gallon fuel tanks can keep the boat on the run for extended periods. The hull is built with a cold molded jig method and uses three layers of 3/8-inch Okoume plywood on the bottom and three diagonally-planked layers of ¼-inch Okoume on the hull, each with fiberglass and epoxy between each layer, which make the structure glassed inside and out. 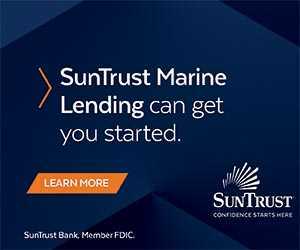 “All of our boats, Carolina boats especially, have a sharp entry and a modest exit as far as deadrise, and that’s what makes it stable,” explains Mann. Paul Mann Custom Boats have a hull design that incorporates a subtle convexity that allows the boat to run much harder and faster in a heavier sea. The boat is controlled from the bridge deck as well as the tower helm. The bridge centerline helm places all the controls and instruments within arm’s reach and eyesight. Therefore, it requires minimal movement on the captain’s part when in the thick of the action. The 360-degree unobstructed view from both locations allows clear visibility to what’s going on in and around the boat. The tower helm is offset for a larger display that helps when exposed to weather. 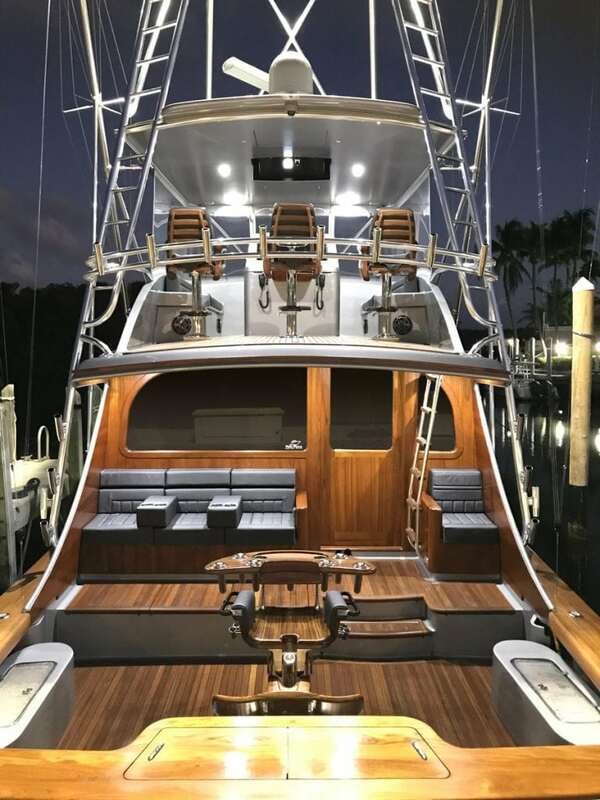 Three Release Marine helm chairs with custom satin finish cushions provide comfort at the bridge helm equipped with the latest in electronic and mechanical technology, including Garmin multifunction displays and KVH satellite communications. A clear, acrylic panel protects the displays while instruments are protected in an overhead compartment that opens when in use. An ingenious safety feature for the helm is the valve setup incorporated into the steering system. Also, if steering on the bridge fails, valves under the helm can be shut off. This keeps the system pressurized and allow steering from the tower and vice-versa; the same valve setup is installed under the tower helm. The bridge deck has two lounges forward of the helm that provide plenty of room for guests or the family to enjoy the open air and 360-degree views. Additionally, the area also provides lots of storage space for gear and rods. In front of the console, a cushioned seat conveniently houses a custom-built freezer. The bridge is protected from the elements with a hardtop and removable front and side panels. The cockpit is the heart of fishing on Jichi. The equipment is configured for any style of fishing: Livewell systems are set up very specifically and rod holder systems are strategically placed. 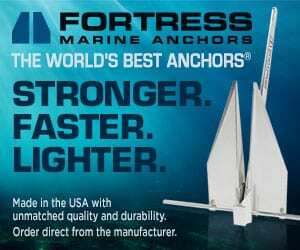 “Dredges and chains and teaser systems are set up very high-tech and easy for the captain to operate,” says Mann and adds that the tower and everything put in the tower was made to do certain types of fishing. The boat is set up to adjust from dredge fishing to kite fishing to trolling. When it’s time to empty the wells or if seawater swamps the rail on back down, two three-inch and two two-inch drains quickly discharge the water from the cockpit. A custom fish box with stainless steel liner along with Dometic freezers and refrigerator built into the mezzanine keep fish fresh and drinks cold. 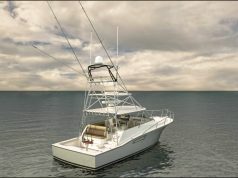 Four electric reel outlets under the washboards and six Release Marine heavy-duty, 30-degree rod holders with liners add to this yacht’s fishing arsenal. In the heat of the battle, air conditioning keeps crew cool. Hidden slots built in the back bulkhead cool the cushions and provide a refreshing breeze. Mann tested overhead and corner chines for air-conditioning vents. Hence, he designed a slot system that provides direct cold air without seeing a grill. “I want you to feel the air conditioning, and I want you to have to find where it’s coming from,” he says. Mann started at the bottom, but celebrates 30 years in business in 2018. He’s learned to be consistent in the face of continuing change. By the looks of it, Mann has adapted to new materials, new electronics, and new processes. 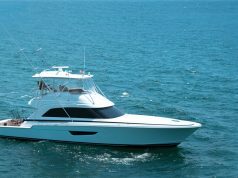 But he consistently builds magnificent fishing yachts that provide superior performance. Previous articleSportfish or Center Console?